However, for active-duty fans of the popular video game franchise, Call of Duty,, it did get more surreal when YouTube Personality LEGIQN and the makers of the game “Call of Duty: WWII” came walking through the USO. Dan Rosenberg, Executive Director of the Call of Duty Endowment, dons a protective suit worn by Explosive Ordnance Technicians at Ramstein Air Base in Germany, during the USO tour there in April 2018. 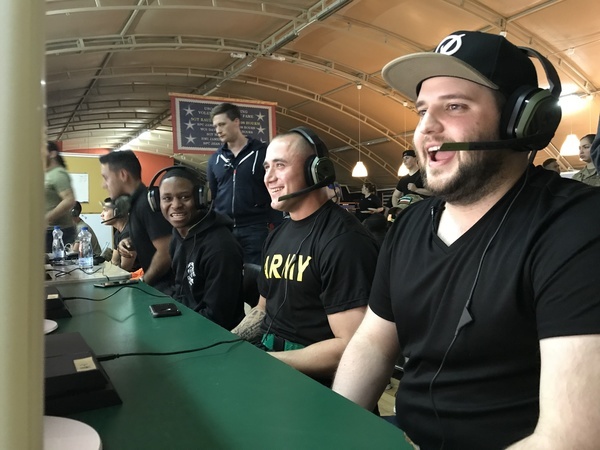 YouTube Celebrity LEGIQN plays in a local video game tournament on the popular title, “Call of Duty: WWII” with troops at Camp Buehring, Kuwait. 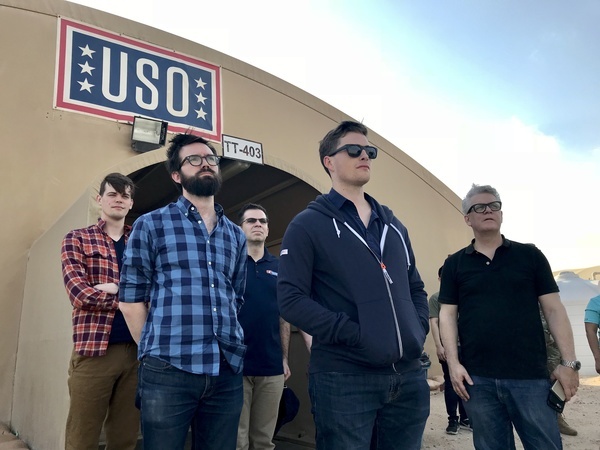 Game designers and gaming reporters stand for colors outside USO Camp Buehring, Kuwait, during the first-ever Activision / Call of Duty Endowment USO tour in April 2018. Service members who came to play the new downloadable content said they play video games like Call of Duty for a variety of reasons, but the most common reason was to bond and communicate with loved ones back home. LEGIQN joined Activision and Sledgehammer Games staffers in a tour through three bases in Germany and Kuwait. The team was so inspired by service members’ excitement for the game and their USO tour that, upon their return, Activision donated an additional $100,000 worth of games to be distributed to service members stationed throughout the world via USO programs. “Call of Duty is inspired by those who serve,” said Dan Goldenberg, executive director of the Call of Duty Endowment.